Gregory Jacobs’ “Wind Chill,” is a horror movie that slipped out into theaters a couple of years ago. However, I’ve been reading more and more about it recently, (Mr. Peele’s Sardine Liqueour wrote up a very nice review,) and the petigree, (Jacob’s previous film, “Criminal,” was a fun thriller, and two of this films producers were George Clooney and Steven Soderbergh. 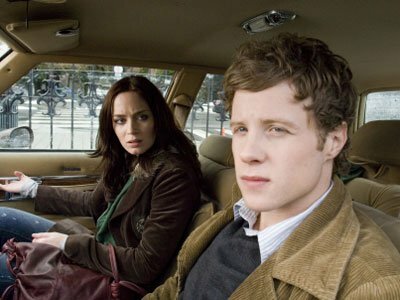 “Wind Chill” stars Emily Blunt as an un-named college girl heading home for the holiday season. She finds someone going her way on the school’s Ride Board. However, early on into the ride, things turn strange. The guy, played by Ashton Holmes, knows a lot about the girl. He had prepared a picnic meal of her favorite foods. He also doesn’t know anything about Delaware, the state he claims to be from. And then he decides to skip the highway and take the ‘scenic route.’ Bad idea. A car heading towards them doesn’t move over to make room and Blunt and Holmes end up flipping their car. The car that drove them off the road disappears. And then they start seeing strange things. It’s a fine, fun movie, but instantly forgettable. The big reveal at the end of the movie leaves you wondering if you missed something, because it’s so underwhelming. Blunt and Holmes are excellent and, truly, carry the movie on their shoulders. If they weren’t strong, this thing would sag. I enjoyed Jacobs’s first movie, but here he seems a little out of his element. In the beginning, the camera is constantly moving, as if Jacobs is trying to get the desire to move out of his system before the movie sticks him in the one-location set for the last two-thirds of the movie. One would expect that the tension in the movie would come from the enclosed car, with things happening outside, but the two main characters stuck inside. However, they both keep getting out and running around, making the claustrophobia not a huge issue. For me, “Wind Chill,” feels like a bit of a wasted chance. Blunt is a good actress and seems to be better than the material she is given here. The concept of two people stuck in a snow drift is a good one, but it’s quickly watered down and the tension is lost. The idea of a supernatural demon is interesting, but, it’s kinda wasted until the last ten of the movies. It feels like there’s a twist coming at the end of the movie, that everything will become clear in the end, however, Jacobs instead settles on slow-motion shots and swells of violins on the soundtrack.